Third wave. Did not reach Sorpe Dam because of navigation problems, flak damage and weather conditions. Returned with mine intact. William Douglas Bickle, known to his family and friends as Douglas, was born in St Ann’s Chapel, a small hamlet near Calstock in Cornwall on 6 March 1922, the only son of Percy and Alma Bickle. His father worked as a farmer. Bickle joined the RAF in October 1940, soon after his 18th birthday, He was selected for training as a wireless operator/air gunner. After qualifying he was posted to 25 Operational Training Unit, where he crewed up with Cyril Anderson and the core of the crew who would later fly on the Dams Raid. They moved on to 1654 Conversion Unit, where the whole crew was formed up. The crew were posted to 49 Squadron in February 1943, and did their first operation together as a crew on 12 March. After their second trip, they were posted to 617 Squadron but in fact stayed on 49 Squadron to do three more operations, including two to Berlin. 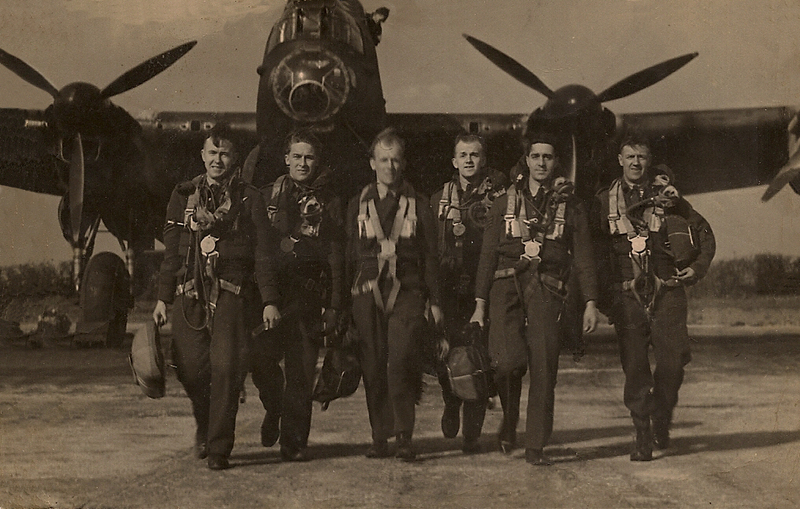 After their trip on the Dams Raid, the Anderson crew returned to 49 Squadron and resumed their operational career with an attack on Krefeld on 21 June. Altogether, they flew on 14 more operations in 49 Squadron, but on 23 September they failed to return from a successful attack on Mannheim. Bickle had got married on 9 August 1943, a few weeks before his final fatal operation, to Violet Bickford, a woman from his home village. They were married in Wembury, Devon, where her father was working as a NAAFI canteen manager. Violet Bickle remarried after the war, and moved to Liverpool. Bickle and his comrades were all originally buried in Offenbach cemetery. After the war the bodies of all seven were exhumed and identified. They were then taken to Rheinberg War Cemetery. Bickle is commemorated on the war memorial in Albaston, a small village on the western side of the Tamar river, just over the border from Devon. Thanks to Dom Howard for help with this article. All the Anderson crew are commemorated on Dominic Howard’s excellent website. Each of the crew has their own page with biographical details, there is a complete list of the operations undertaken by the whole crew and a full account of their final flight on 23 September 1943.